We are your reliable experts in maintaining “zero-tolerance” properties such as medical centers, retail properties, and also town-homes among others. 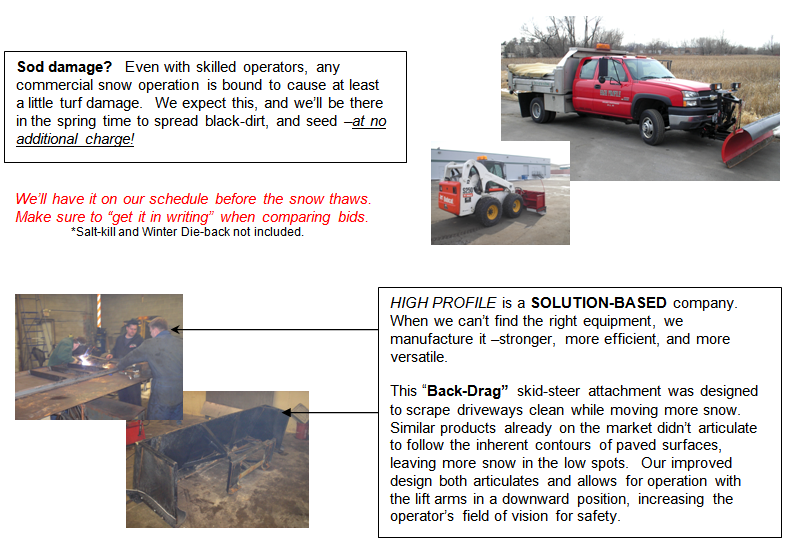 HIGH PROFILE provides complete service on snow and ice management including plowing, salting, sidewalk shoveling, stacking, and hauling. With 24 hour monitoring, innovative newer equipment, and the latest industry techniques, we reduce your liability by maintaining the safest possible conditions during severe weather. We Offer Complete Snow-plowing / clearing of driveways, drive-lanes, and parking areas shall be performed on snowfalls with accumulations of 0 to 2 Inches or more, over a single weather event. All paved areas will be completely cleared of snow once, within 12 hours of cessation of snowfall. Open-up services are available by 8:00 a.m., or 4 hours after cessation of snowfall. An open-up is a preliminary bulk clearing of snow often done in order to facilitate a better complete clearing to follow. During heavy or severe snowstorms, entrances and main thoroughfares will be periodically cleared at approximately every 2-4 Inches of accumulation to maintain emergency access and drivability. Service Calls. Our equipment can be dispatched 24/7 upon request for emergency service, such as entrances plowed in by municipal plow trucks. Access Points such as fire hydrants, mailboxes, and dumpsters will be kept accessible to pedestrians. Landscape areas and trees will not be buried with snow, and avoided to prevent salt damage, soil compaction, and physical damage. Our facility is staffed 24 hours per day during the winter months to monitor weather conditions using the same road-mounted sensor technology as MN/DOT, and real-time radar imaging. Snowfalls of 10 Inches or more may be billed at hourly rates. Sidewalks include private hard-surface walkways (HOA -up to 3 Ft. width) running directly from parking areas, drive lanes, driveways, and to the entrances of homes and/or buildings. Inter-connecting private walkways are included. Sidewalks which are not free of obstacles such as dog leashes, newspapers, and children’s toys will not be cleared. City Sidewalks are public walkways generally on the perimeter of the property. Sidewalk clearing service shall activate upon 0 to 2Inches of accumulation, during a single weather event. All designated walks can be cleared within 0-24 hours of cessation of snowfall. Ice-melt Service* is done using quality products specifically designed for this application. High Profile will not be held liable for pitting, cracking, or scaling of concrete when applying product according to manufacturer’s specs. De-icing is an additional service billed per-ton applied, with a 1-ton minimum charge. An appropriate de-icing or traction agent will be applied to parking areas and private drive lanes. This service shall be on an on-call basis by default, with the Property Manager, Authorized Agent, or their Designee assuming the ultimate responsibility and liability of monitoring conditions. HIGH PROFILE does offer an auxiliary level of monitoring service, if a specified level of discretion has been granted to HIGH PROFILE –see De-icing Amendment attached. Removal of ice build-up or severe hard-pack conditions due to heavy traffic, drainage, and freeze/thaw cycles is an additional service billed at hourly rates, plus materials. Salt /Sand Barrels (approx. 20/80 mixture) are also available for delivery and strategic placement on the property for use by residents, or on-site personnel. Lids & Scoops included. Refills available. Extreme winter conditions may necessitate the need for hauling, stacking, piling, blowing, and drift clearing. Proper clearance must be maintained to accommodate the next snowfall. These services are billed at the hourly rates listed below. We use only well-trained and experienced operators to keep your cost to a minimum. HIGH PROFILE holds weekly training meetings for reviewing techniques to service each individual property as safely and efficiently as possible. TIER I – Bare Pavement Directive. This option is our highest level of service which allows us to reduce your liability by maintaining the safest possible conditions on your lot by de-icing application upon any amount of precipitation, or as a preventative against anticipated thaw-freeze cycles, as well as post-plowing application. TIER II – Unsafe Conditions Directive. This option allows for applications to occur if your lot is currently unsafe or has precipitation present upon inspection, as well as post-plowing application. TIER III – Below Contract Snowfall. This option allows for applications of de-icing to occur for snowfalls which coat most of the lot, but do not reach activation depth to trigger contract snow plowing services. It also allows for application if your lot is currently unsafe upon inspection, as well as post-plowing application. TIER IV – Ice/Sleet Storm. This option allows us to apply de-icing material only in the event of a notable ice or sleet storm, as well as post-plowing application. TIER V – Call-in Only. This is our lowest level of service which does not provide any monitoring service. HIGH PROFILE has designated de-icing vehicles performing regular routes to monitor and service properties. Properties which choose the “Call-in Only” option will be billed a trip charge of $85.00 in addition to the per-ton applied rate, as they will require designated loading and travel time outside of these regular scheduled routes. NOTE: You may want to consider adding a “cap” to the call-in option. An example would be authorizing “two times per month”, or even a specific dollar amount. This will allow you to avoid trip charges for these pre-authorized visits, and we can reserve them for use during the most appropriate conditions, such as a notable ice/sleet storm, ensuring that conditions are made safe in the timeliest manner. Once the cap is met, you would resume as a “call-in only” property, or call to request service at any time.